Whether you embrace the au natural look, full glam or anywhere in between, skin will always be your best foundation. But can you get skin that requires #nofilter solely with your trusty skincare routine at home? Your skin might not beat like your heart or inflate like your lungs, but it’s constantly hard at work, taking zero breaks to protect your body. Although it’s inherently equipped to perform its day-to-day functions, your largest organ is constantly ravaged with internal and outside forces that slowly weaken and compromise its structure and appearance—think UV radiation, pollution, makeup, dirt, extreme temperature fluctuations, hormonal changes and more. This is why it’s so important to diligently take care of it and give it the boost it needs to look and feel its healthiest. The best way to do this? Nurture your skin with skin care formulated with effective, clinically proven ingredients and complement your daily routine with regular professional treatments. For the most clarified, bright and revitalized complexion possible, the two absolutely go together. Why should you see a skincare professional? IMAGE firmly believes in maintaining a healthy skin diet that involves a synergistic marriage between home care and professional care. Whether you prefer an esthetician or dermatologist, a professional touch does wonders for your skin—yes, even though you’re extra attentive to your skin at home. Home care is essential in providing ingredients that will provide correction, prevention and nutrition to your skin daily, while a professional care routine helps hone in on repairing and renewal. Think about it this way: stretching and massaging yourself at home (or even asking a friend to do it) can help alleviate some tension, but there’s nothing like a session with a massage therapist who can rub out those knots and thoroughly soothe your muscles back toward homeostasis. Your body feels at ease, and it’s at a better starting point to heal. IMAGE professionals work with our high-performance ingredients available in higher-strength, higher-active levels to give your skin a thorough, deep cleansing and rejuvenation. Your skin gets a thorough “reboot,” which makes the results a lot more long lasting, noticeable and sustainable. Our facials and collection of Clinical Couture Designer Peels provide options ranging from organic enzymatic peels to advanced solutions that will provide correction to the skin. These treatments are only available from a licensed skincare professional. On top of that, seeing a professional regularly helps you seamlessly adjust your skincare to your skin’s changing needs. You might have your favorites, but depending on a multitude of factors—a change in geography, hormones or a new condition like hyperpigmentation or acne—your IMAGE expert is your best skin ally, taking all the guesswork out of adjusting your skincare routine. To book an appointment with a savvy IMAGE professional, click here to see who’s near you! Your IMAGE specialist will, of course, tailor your experience to your unique skin, but take a little peek into a professional session by learning more about our Signature Peel Lift, our hallmark treatment loved by skincare fanatics and experts all around the world. Like all our products and treatments, it’s all about RESULTS. The Signature Peel Lift, which is especially ideal for those with redness-prone, dry or dehydrated, or dull skin is also a boon if you’ve just had microdermabrasion or are recovering from the aging effects of smoking. 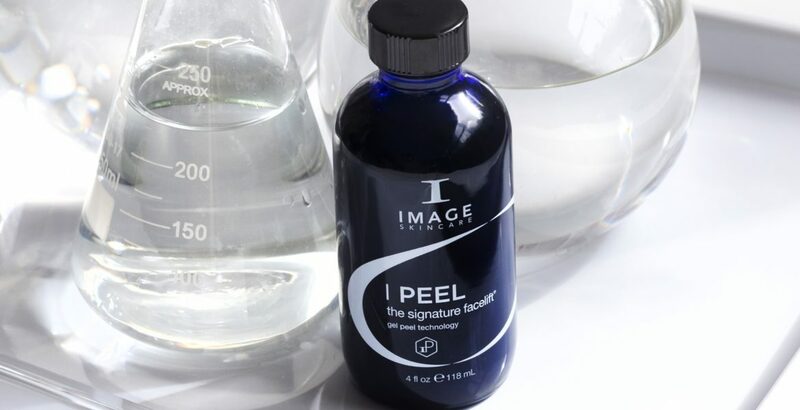 The peel works to accelerate cellular renewal, the key to getting your freshest, healthiest skin to the surface, while firming and uplifting skin. Vitamin C, the ultimate antioxidant, is one of the most studied and proven skincare ingredients available. The nutrient is credited mostly with its ability to brighten skin and reduce the appearance of dark spots; helping to simulate collagen production; and fiercely protect the skin from free radical damage, which contributes to accelerated aging. Hyaluronic acid, a natural substance found in skin that can hold 1,000 its own weight in water, instantly replenishes skin with hydration and plumps up skin to smooth out the appearance of fine lines and wrinkles. We are all born with ample levels of hyaluronic acid (hence why babies have such soft and plush skin), but we progressively lose it with age. By adding it to your skin you help your skin reclaim its youthful vitality. Pineapple and papaya fruit enzymes, respectively called papain and bromelain, potently dissolve the dead skin cells that cause buildup, congestion, and dullness, which thwart the skin from looking its most radiant and fresh. A series of professional enzyme treatment can help reduce the appearance of hyperpigmentation, hydrate, improve elasticity, clarify and brighten your overall skin tone. Centella Stems Gx™ is our unique formulation comprising stem cells from gotu kola, an anti-inflammatory and traditionally used herbaceous healing plant known to help stimulate cell growth (in fact, it’s also referred to as tiger grass because tigers are known to roll around on the plant to help ease their wounds!). Gotu kola helps provide relief against the signs of redness and irritation while also protecting the capillary wall and inhibiting excessive dilation in blood vessels. These stem cells are combined with brightening, protection, detox and energy complexes that help produce a newly vibrant, luminous complexion. LUMINESCINE is derived from a yellow flower of the Mediterranean and is the first natural active ingredient for cosmetics used for luminescence. Its phytocomplex is able to protect the skin from harmful high energy UV radiation, transforming it into a source of light that radiates directly from the skin. Tests showed that LUMINESCINE is able to adsorb UV and visible light and to transform part of the adsorbed energy into visible light on the skin. These key ingredients are blended in a base of organic aloe vera, a famed ingredient that’s so hydrating, healing and therapeutic that medical facilities use it to help alleviate wounds and burns (it’s not just a post-sunburn remedy). To ensure you walk out from your treatment with optimal results, try to avoid doing things that might make your skin extra sensitive, such as using aggressive, exfoliating skincare products, waxing, depilatory creams or getting too much sun. 1) Discontinue all use of alpha hydroxy acid (AHA), beta hydroxy acid (BHA) and benzoyl peroxides. 2) Stop any exfoliating products that may be drying or irritating. 3) Men, do not shave the day of your peel. After receiving your peel do not use any skincare products that have not been approved by your licensed aesthetician or physician. Your treatment will be completed with IMAGE products that are safe to be left on your skin for the evening. Talk to your esthetician or dermatologist about the best skincare routine for you, but generally you should continue committing to a ritual with cleanser, serum, and broad-spectrum sunscreen in the mornings; and cleanser and moisturizer in the evenings—at minimum. Ready to get your skin to its peak health? Find a nearby IMAGE skincare professional today and see the difference!